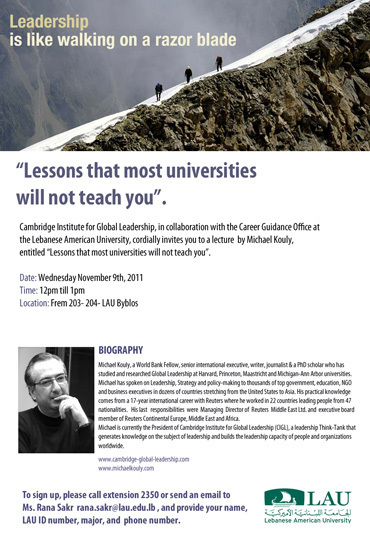 The Cambridge Institute for Global Leadership, in collaboration with the Career Guidance Office invites you to a lecture by Michael Kouly. Biography: Michael Kouly is a World Bank Fellow, senior international executive, writer, journalist and Ph.D. scholar who has studied and researched Global Leadership at Harvard, Princeton, Maastricht and Michigan-Ann Arbor universities. Michael has spoken on leadership, strategy and policy-making to thousands of top government, education, NGO and business executives in dozens of countries from the United States to Asia. His practical knowledge comes from a 17-year international career with Reuters where he worked in 22 countries leading people from 47 nationalities. His last responsibilities were Managing Director of Reuters Middle East Ltd. and executive board member of Reuters Continental Europe, Middle East and Africa. Michael is currently the President of Cambridge Institute for Global Leadership (CIGL), a leadership think-tank that generates knowledge on the subject of leadership and builds the leadership capacity of people and organizations worldwide. He is the Founding President of Leaders Across Borders (LAB), a non-profit international body that promotes leadership initiatives across national, racial, religious, social, ethic and cultural boundaries. To sign up: Please contact Ms. Rana Sakr at rana.sakr@lau.edu.lb or call ext 2350. This event is open to LAU students and alumni.